Excellent guys. Thanks for adding. It's great to see so many cars now giving these high power levels on the standard internals. 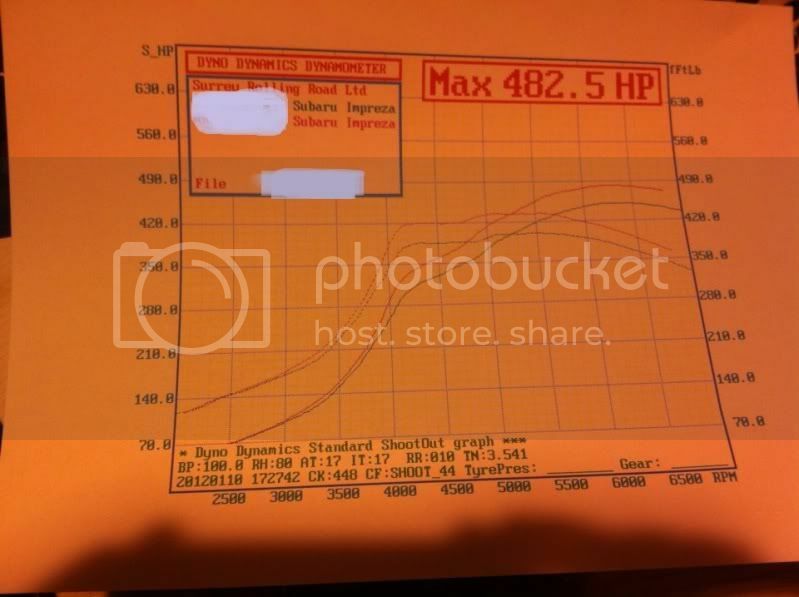 So am I running the most Sn with standard v3 engine and box at 380 /360 ? Maybe mate?.......add the rest of the details in ASAP. Last edited by sonic93; 20 October 2012 at 07:43 AM. 2) Shaun - 480bhp / 465lbft - 2006 JDM 2ltr STI, 20% Meth Mix, Billet LM450, BRD Induction Kit, SFS Intake Hose, Hybrid FMIC, 800cc inj, 3" Miltek and standard ECU mapped by Tracktive Solutions and power figures from SRR. 7) Paulo P (Paul), 421bhp, 360lbft, 2005 sti short motor, ported and polished sti 3 cylinder heads, MD321S turbo (hence the low torque due to lag on a 2 litre), nismo 740cc injectors, 76mm inlet under a much modified version 3 inlet manifold system, tubular headers, FMIC, AVCR, Power FC, Z32 MAF + a lot more! 18) mickywrx - 329.4/289lb/ft MY94 WRX Standard EJ20, standard ECU, Standard TD05, Standard 380cc injectors, V Power only, 1bar boost, couple of bolt on's, NOT remapped. Guys, the ones marked in Blue . Can you confirm what the car is used for etc? Or in Addi case.........more info fella. The ones marked in RED. Jay and Paul. Aren the cars brown bread? Mines a daily driver that's done a bit of drag racing. 2) Shaun - 480bhp / 465lbft - 2006 JDM 2ltr STI, 20% Meth Mix, Billet LM450, BRD Induction Kit, SFS Intake Hose, Hybrid FMIC, 800cc inj, 3" Miltek and standard ECU mapped by Tracktive Solutions and power figures from SRR. Predominantly road use, but is used for everything and anything, including public track days and competition use. Some very impressive results here guys just on bolt ons! Guess i can add mine. 8) Paulo P (Paul), 421bhp, 360lbft, 2005 sti short motor, ported and polished sti 3 cylinder heads, MD321S turbo (hence the low torque due to lag on a 2 litre), nismo 740cc injectors, 76mm inlet under a much modified version 3 inlet manifold system, tubular headers, FMIC, AVCR, Power FC, Z32 MAF + a lot more! 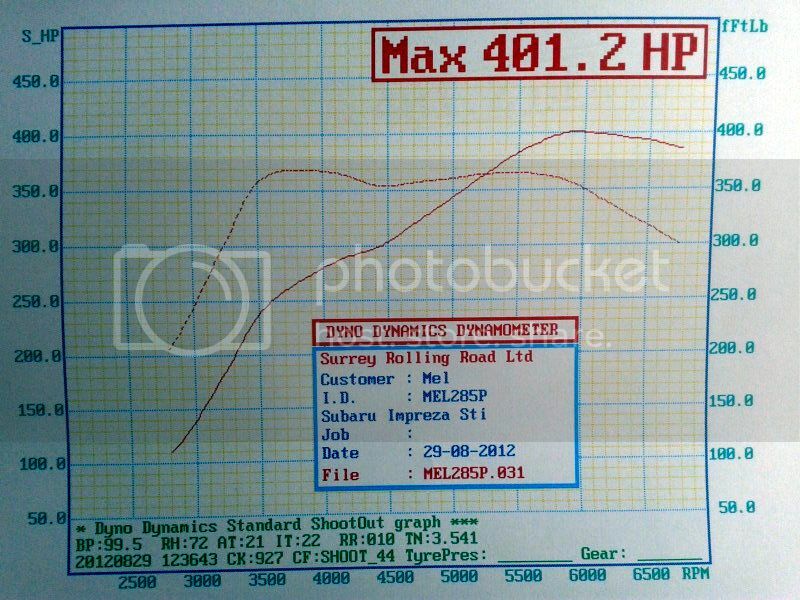 20) mickywrx - 329.4/289lb/ft MY94 WRX Standard EJ20, standard ECU, Standard TD05, Standard 380cc injectors, V Power only, 1bar boost, couple of bolt on's, NOT remapped. Last edited by MrNoisy; 21 October 2012 at 02:26 PM. 3) Scoobyken - 471/ 430lbft 2004 sti type uk/ vpower+20% Meth/ Sc42 billet turbo/ 740cc inj/ Lateral headers with harvey up-pipe, full 3in turbo back GRD race system/FMIC/ Simtek ecu mapped by JGM @ SRR weekend toy. We really need to put graphs up as peak figures don't mean all that in isolation. If you look at the whole powerband then I suspect mine would be top of the list. You are more than likely right though. The JDM and Hawkeyes have a better spool over the more dated Bugeye or even the blobeyes. Yours is FBW too Shaun? I'll post up the boost graph later when I am home. At the end of the day its all to show people how much the stock internals can take with bolt on's and a good map (Not to mention looking after the car/engine in general) . Going by the results listed above its great proof. Well done guys. Steve, given that it's a T, that's a superb spool up rate; your full torque amount is available about 200-300RPM earlier than it is on my 20g. Behave - JDM's are properly controlled and NOT DBW. I suspect the better heads and cams, together with the twinscroll headers and up-pipe help the whole package on the later JDM's. However, I suspect the Lateral 321T is probably the same spec as the Billet LM450 and your and my results certainly show a level of consistency on that front - which is nice to know from two different cars. Couple all of this with shorter ratios on 5th and 6th on a JDM box and it all equates to a package that makes for a very sharp and quick road car.... whatever gear you're in. Sorry folks, stuck Turbotits in rather too far up - my mistake! Think we shld all meet up at Surrey rolling road and everyone can put there cars on and see if we're still getting these figures! Would also be interesting to hear which dyno the current results were obtained from. Last edited by Turbotits; 22 October 2012 at 06:26 PM. Mine was done 2 months ago too @srr! But I'm not certain if figures are gona stay the same without keeping it remapped again from time to time. I've had a 30bhp loss in 2 weeks before, that really pee'd me off! Why on earth do you think it needs to be remapped "from time to time"!? If the spec doesn't change it won't need remapping. Erm, let me think about that for a moment. Best part of a 600 mile round trip to stick my car on some rollers? Don't be daft! Spec of my car didn't change Shaun, the car felt different! Plus it made 380bhp at the time it came off the rollers at scoobyclinic and I tho it shld do better than that with sc42 on ecutek. 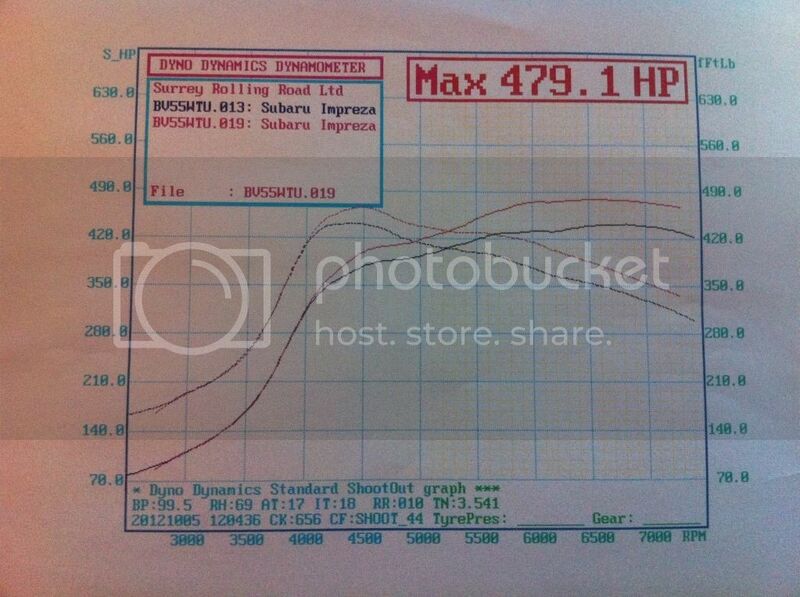 2 weeks later I took it to srr and it made 350bhp?? Must have been something up then, but that doesn't mean it needed a remap. Yeh, changed over to simtek and made over 400 straight away..
21) mickywrx - 329.4/289lb/ft MY94 WRX Standard EJ20, standard ECU, Standard TD05, Standard 380cc injectors, V Power only, 1bar boost, couple of bolt on's, NOT remapped.